A lot of us here are Great Wall are dog lovers. And like any devoted canine companion, we have hundreds of digital photographs of our beloved pets. As custom wallpaper designers, we love finding ways to use these snapshots of our dogs in creative ways for interior decorating projects. 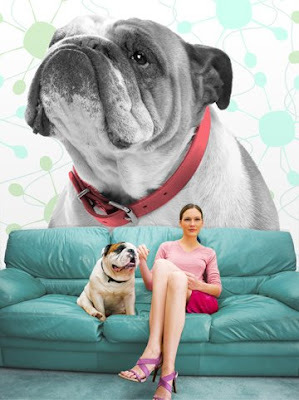 This wall mural features an English Bull Dog, printed larger than life. In keeping with the retro 50's color palette, the wall mural is tinged with color only on the collar, with a muted swirling pattern, again right out of the 50's. This is a great example of how we can use a wall mural to blend multiple design goals to achieve a single cohesive statement. The wallpaper's mash up of retro colors and themes with pet photography is just the tip of the iceberg of possibilities. Say you're a sci-fi fan; we can take your out of this world dog and drop him over a scene of alien planets or a billowing nebula. The point is custom wallpaper allows you to decorate your home exactly as you choose. Cat murals may be printed as well, just don't tell our dogs.